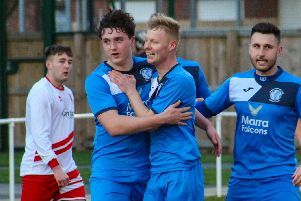 Craig Aspinall hit a late winner as Armthorpe Welfare came from behind to beat Harworth Colliery 2-1 in a relegation ‘six-pointer’. Victory moved Welfare six points clear of Harworth who occupy the second relegation spot in Division One. After losing 11 league games on the spin Armthorpe have now won back-to-back league matches for the first time since mid-September. Colliery had made the perfect start when Mason Barlow curled home a superb 25-yard free-kick to give the home side a fourth minute lead. Chris Simpkins hit the post for the Armthorpe, while a goalline clearance from Tyler Walker prevented Ben Partridge doubling Harworth’s lead. Liam Radford levelled from the penalty spot after 71 minutes after Simpkins was hauled down. Welfare goalkeeper Adam Stevens and Harworth’s Mark West were sent off following a fracas involving both sets of players. Outfield player Leon Larcombe-Loftus replaced Stevens in goal but Harworth could not take advantage. And the visitors snatched all three points in stoppage time when Aspinall timed his run to perfection to lash home past Harworth goalkeeper Sam Jepson. 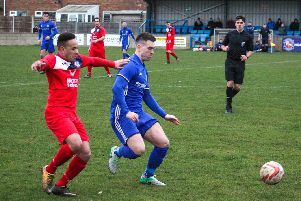 Chris Chapman, newly appointed to Armthorpe’s coaching staff, said: “We had a game plan and stuck to it well in the face of a relentless long ball from the opposition. “We got the ball down and played and were determined to pick up the points against a battling team. “We created the majority of the chances and looked the more threatening in attack. There are still a few things to work on but there always is. The two teams meet again on Saturday at Armthorpe’s Church Street ground.